Subject: Hi [insert name of recipient]! Just a quick note from [choose one: a) An Undisclosed Location b) Somewhere In The Middle East c) I Can't Say, It's Secret]. Things are going really well and I miss you. We have all been given our orders. We will go into Baghdad, defeat the Republican Guard, overthrow Saddam Hussein, secure the oil fields and destroy the Iraqi supply of WMDs. And then after breakfast that day we will be briefed on our next assignment. After I get home I plan on selling all the Iraqi rifles I capture on e-Bay. I should get top-dollar for them as they'll only have been dropped once. p.s. 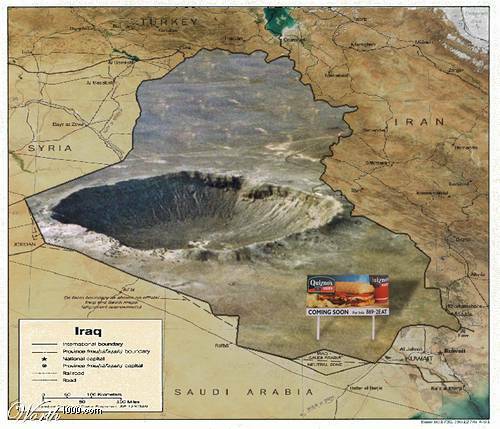 : Central Command has allowed us to attach this new satellite-generated map of Iraq.